Growing up, mom often made grilled cheese sandwiches for lunch. She would use white bread and American cheese, which was good. But I decided to make my own grilled cheese sandwich. I have a few variations on grilled cheese. This time I used 12 grain bread with pepper jack cheese. I always make my grilled cheese with butter. The Pepper jack cheese melts well. And you can't go wrong with cheese and bacon. Award... I am very excited and honored to be awarded. I would like to take a moment and thank www.manusmenu.com for this honored. Please take a moment and visit her blog... great blog! Heat a large skillet over medium heat. Place 2 slices of bread on a plate and butter the top of each bread. Place 2 slices of bread buttered side down in the skillet. Place 2 slices of cheese on the bread, sprinkle bacon on top of cheese. Top with 2 remaining slices of bread, placed buttered side up. Cook until bread browns and cheese slightly melted, about 3 minutes. Turn the sandwiches. Making sure cheese is completely melted and bread is brown. Enjoy! I posted grilled cheese sandwich recipe on Wednesday, but as you already know blogger was offline for more then 24 hours. Somehow this post was deleted. So, I re-posted today. I'm glad I back up everything. It would be very painful if I lost my blog. 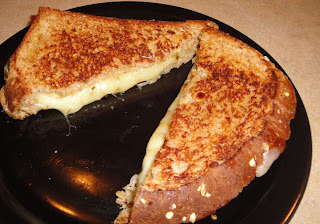 You can't beat a great grilled cheese sandwich and it looks like you have a very tasty one here! Nothing beats a grilled cheese samwich! Congrats on your award...well deserved!